The track across Matterdale Common is well worn and easy to follow if sometimes boggy in parts. 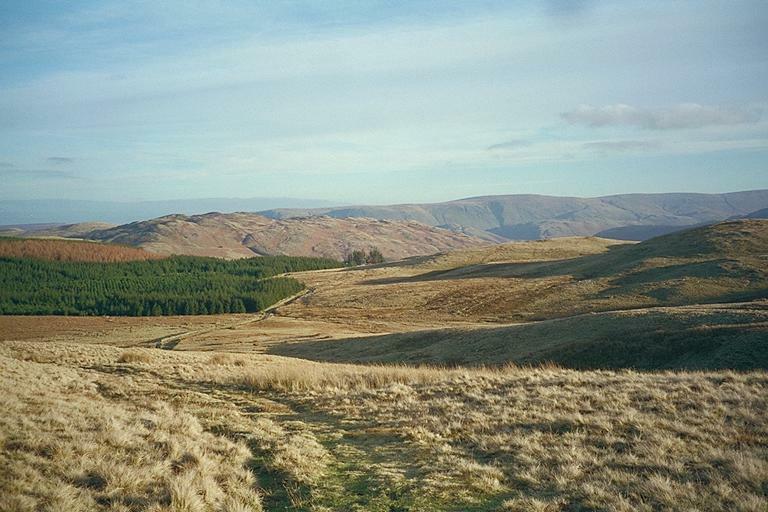 On the left is the Cockley Moor plantation with Gowbarrow Fell beyond. On the horizon, to the right of Gowbarrow are the hills of High Street - the old Roman road - Bonscale Pike, Loadpot Hill, Wether Hill and, at the edge of the picture, Red Crag. Steel Knotts is the fell in front of Loadpot Hill, with bits of Hallin Fell and Sleet Fell either side. Smaller version of this picture.